According to Oregonians, we need to do a better job of attracting talented teachers and compensating them in a way that will keep them on the job. They say we need to watch out for children who might fall through the cracks, and we need to make sure schools are accountable and transparent, and that dollars are being used in the most effective way. In late October, Oregon's Department of Education released its much-awaited report card for Oregon schools. The report showed us two things: One, that schools haven't made much progress since the last one; and two, that education is of high enough interest to Oregonians that the report's timing became a political football in the governor's race. As we approach the 2019 Oregon legislative session — and once again, the state tries to balance its budget while ensuring adequate funding for all education programs — we wanted to ask Oregonians' opinions about education in this state. Are schools making the grade? The answer depends on which schools you're asking about. 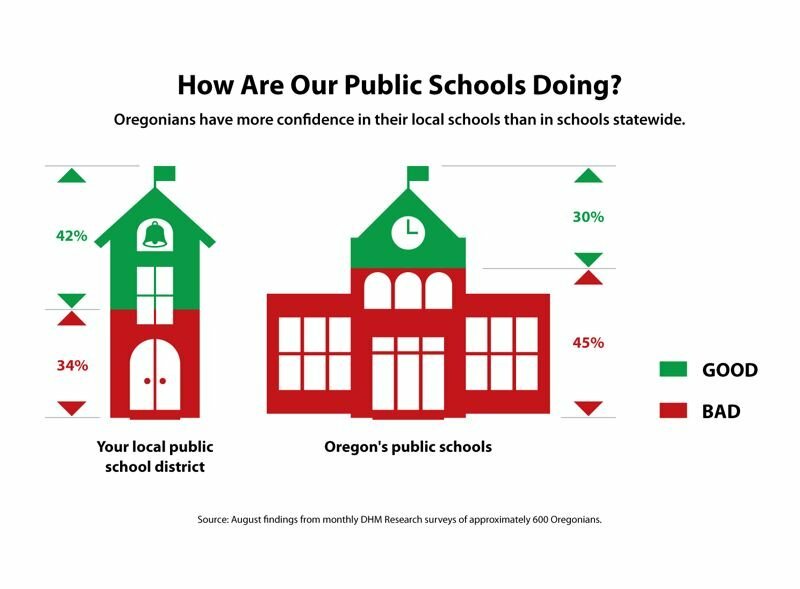 Oregonians have slightly more faith in their local schools than they do in schools across the state. Forty-two percent feel their own districts are doing a good job of educating, while 30 percent feel the same about the state's schools, and 45 percent think schools statewide are doing a poor job. The largest gaps in perceptions about school performance are between members of different political parties and those with different political ideologies. For example, 51 percent of Democrats and 46 percent of liberals think their local schools are doing a good job. Just 33 percent of Republicans and only 27 percent of conservatives agree. A majority of Oregonians, 57 percent, say the state's K-12 system should be among the best in the country. But let's not overreach! Only 13 percent think the schools should be the best in the nation. About a quarter of all Oregonians think we should be satisfied with the level of education we have today. Liberals (63 percent) are much more likely than conservatives (42 percent) to think Oregon schools should be among the best in the nation. A majority of respondents found that nine items, of a suggested 16, were big or very big obstacles to school success. The strongest results were: lack of direct parental support (71 percent); administrative waste and inefficiency (66 percent, with 45 percent seeing this is a very big obstacle); and lack of both qualified teachers and stable, adequate funding (each at 65 percent). Once again, liberals and conservatives have very different perspectives on these topics. 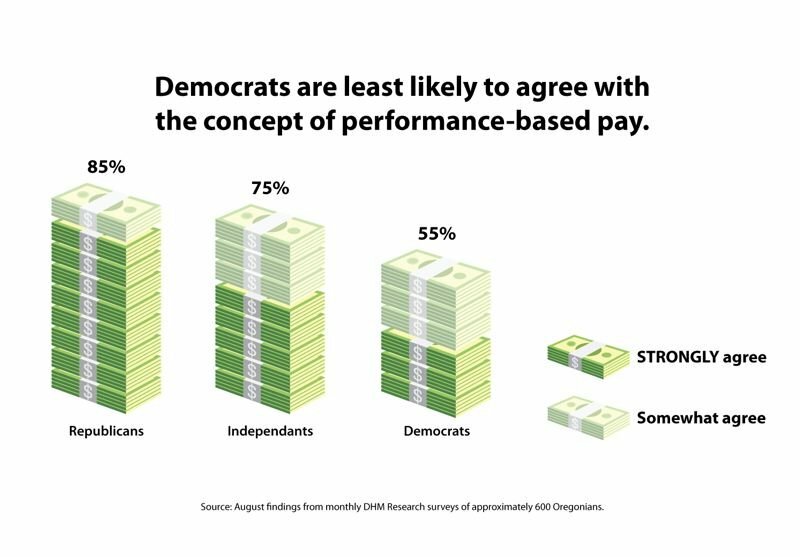 While 91 percent of liberals see inadequate funding as a problem, only 31 percent of conservatives agree. This is mirrored by a Democratic/Republican split of 87 percent to 34 percent. In contrast, 36 percent of Democrats and 35 percent of liberals think school districts' failure to hold individual schools accountable is a big obstacle, while 70 percent of Republicans and 71 percent of conservatives, about twice as many, see this as a major problem. Oregonians are concerned about the education all children are receiving. Just under 70 percent agree that too many students are falling through the cracks. • 64 percent agreed that it is too hard to fire bad teachers. In 1990, Oregonians voted for Ballot Measure 5, capping property taxes available to schools and shifting much of school funding responsibility to the state. In the nearly 30 years since that measure passed, school boards and the Legislature have struggled with school funding. Against this backdrop, we find that Oregonians have varied — and sometimes incorrect — information about their public schools. For example, Oregonians think that 37 percent of school budgets go to central administration, when the true number is closer to 10 percent. Developing consensus on a path forward will rely on solid information, continuous dialogue between Oregonians and teachers and parents and administrators, and a recognition that all of us have the best interests of children at heart. Adam Davis is co-founder and senior counsel of DHM Research. Findings come from the company's monthly surveys in August and October; a representative sample of about 600 Oregonians participated each month. The margin of error ranges from plus or minus 2.5 percent to 4.2 percent. You can find more survey results at dhmresearch.com.